How do I grant/revoke access to a custom layer? The ways you can control what users have access to layers in your plan. When you are first uploading a custom layer to Fulcrum you can set which users that you wish to grant access to that layer. From the Fulcrum homepage on the Fulcrum web app, click on setup in the sub-menu and select Layers. This takes you to the layers page. On the layers page, there is a create layer button in the upper-right part of the web page. Clicking this will take you to the page where you can create the custom layer and select the members you wish to grant access to the layer. For existing layers, there are two ways that you can change who has access. Either through the layers page or through the members tab on the settings page of the Fulcrum web app. On the layers page, you can click the edit button to the right of the layer name that you wish to change the permissions for or the name of the layer. On the edit layer page, you can edit the permissions and then update the layer. 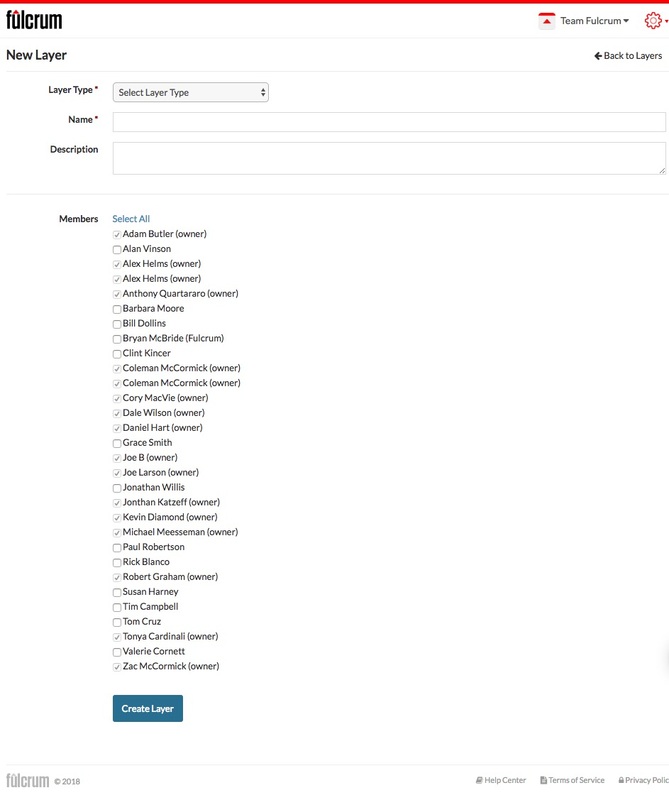 On the members tab of the settings page of the Fulcrum web app, you can edit the permissions for specific user account that are members of your plan. Besides the layers, you can also edit the member's role and what apps and projects that they have access to.